There are several business situations when a mobile app with a reliable and accurate navigation solution is necessary. Airports, malls, museums, event halls, hypermarkets but even brand and product marketers are looking for solutions to define the mobile app user’s location as accurately as possible – so they can send relevant, location based messages or show venue based content to their customers. GPS is able to get signals from satellites to define a position, however the given location may not be really accurate – this for sure happens, when satellite signals are blocked by roofs, buildings and their structures. iBeacon, as another solution, can be used for indoor positioning, but if the area to cover is huge – like an airport, mall, a hypermarket or museum – the installation can be a problem. Beacons usually operates on batteries, so wiring is not necessary – but then replacement of batteries occur time to time. The biggest challenge is however, again, accuracy – even in the case, when a full net of beacons are installed in the venue. Triangular calculation is still not that good. iBeacons are perfect to trigger app content based on simple proximity. 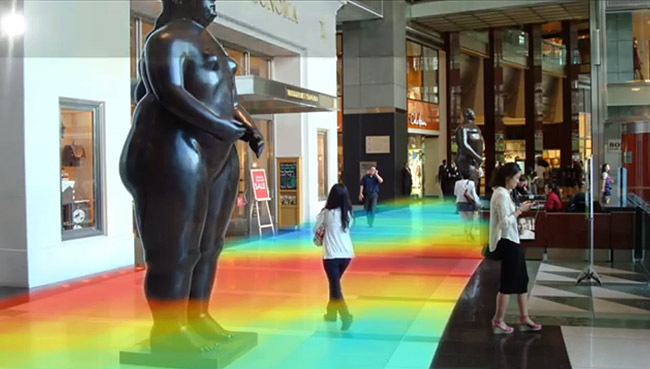 A new and hyper accurate solution for Indoor Positioning is a technology using the disturbances in the Earth’s magnetic field caused by the buildings themselves. Indoor Atlas scans buildings for their internal magnetic map. The fields vary within the structure, providing different fingerprints for different locations within. The smartphone’s internal compass can be used to detect the disturbed field and, based on the comparison to a reference map, can define the exact location of the user using a cloud database. Doing all this, with an unbelievable, 1 meter accuracy. IndoorAtlas is the only IPS without the need of any additional devices to be installed. The only infrastructure necessary is the building itself, and its natural magnetic field footprint. Arworks is already developing and will launch an airport app using this, magnetic field based navigation system – in this case, actually mixed with an iBeacon system.